Located between Ross and White Head Islands, is privately owned and can be cautiously used as a stepping stone between White Head, Ross and Grand Manan Islands at low water (see Ross Island). It is said to be haunted by the ghost of the original settler, known as “Old Man Cheney”. Aquaculture sites for Atlantic salmon can be seen from the northern shore. The power connection for White Head crosses the island. Access is by foot, four-wheel vehicle (both low-tide only) or boat. Visible from Southwest Head, nine miles out in the Bay marking the most treacherous navigational area around Grand Manan, dotted with numerous ledges, many covered at high tide, and strong currents and tide rips. In 1918, the crew of a four masted schooner was rescued from their life boat after their ship was set ablaze by German sailors from a submarine plying the waters of the Bay near the end of World War I. Gannet Rock is accessible only by boat or helicopter. The light tower and the attached keepers house are both Recognized Federal Historic Buildings, although both are severely threatened to fall into the ocean because of lack of maintenance. The former Fresnel lens is on display in the Grand Manan Museum. Treeless island east of Ross Island with an automated lighthouse, seals and numerous birds, including nesting seabirds. It is accessible only by boat or helicopter. Two smaller islands, Low Duck and High Duck, are just to the north, before Long Island, and frequently have seals hauled out on the rocks at low water and nesting cliff swallows on High Duck Island. Both of these smaller islands are provincially owned. Bald eagles are frequently seen on these islands often attracted by the nesting gulls and eiders. Salmon aquaculture sites lie off the western side of the Great Duck. Located southwest of White Head Island, and largest of Three Island (Hay, Sheep and Kent), purchased by J. Sterling Rockefeller, donated to Bowdoin College (of Maine) in 1935. Nesting Leach’s storm-petrels, guillemots, tree swallows and savannah sparrows are currently the subjects of long-term study by the Bowdoin College Scientific Station. Fog has also been a prime research topic; some of the most acidic fog ever recorded has been found here. Access is restricted and only by boat. Long, narrow island south of North Head and across from Castalia marsh. This island once boasted a busy smoked herring industry. The only remaining structure is a large house. A flock of sheep was introduced by the current owners Seabirds, eagles, great blue and night herons nest on the island. Privately owned, it is accessible only by boat. Aquaculture sites for Atlantic salmon lie just off its western shore. Disputed ownership between Canada and the United States; never fully resolved since the War of 1812. This island's current lighthouse, built and maintained by Canada, guards the other end of the treacherous maze of shipping hazards in the Grand Manan archipelago. Machias Seal Island is popular with bird watchers since it is the nesting place of puffins, razorbills, common murres, common and Arctic terns, eiders, guillemots and storm petrels. The Canadian Wildlife Service (CWS) restricts the number of daily visits during nesting to reduce disruption of the birds. 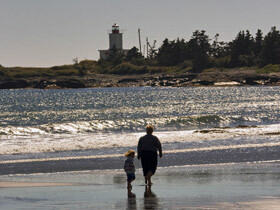 Tours are available from Seal Cove. Whales, harbour porpoises and seals may be sighted en route to the Island. Two light keepers are stationed on the island at all times, working 28 day shifts, arriving and leaving by Canadian Coast Guard helicopter. Keepers live in one of the houses; the other house is used by CWS staff and students. The light tower is a Recognized Federal Historic Building. The entire island and surrounding water is a Canadian Migratory Bird Sanctuary, established in 1943. Privately owned and located across from Woodwards Cove. Accessible only by boat, it is not recommended to land on the island because of the danger posed by the resident bulls that defend “their” island. One of the houses moved from Nantucket Island now sits at the road entrance to Castalia Marsh, a testament to a tradition of floating houses from place to place as the need arose. Salmon aquaculture sites are located on the eastern side of the island. Site of the first permanent settlement on Grand Manan in 1784 by United Empire Loyalists. The island can be accessed by foot or four-wheel vehicle at low tide from the Thoroughfare Road in Grand Harbour or Shore Road in Woodwards Cove. Remember to check the tides before exploring the island. The remains of Fish Fluke Point lighthouse and stone foundations from the loyalist settlers are clearly visible. On spring tides it is possible to hike to Ross Island and then to Cheney Island and finally White Head Island crossing exposed seafloor, but be forewarned that the going is not easy over slippery rocks; you cannot dally. Aquaculture sites can be viewed on the northern shore of Cheney Island. Only other island in the archipelago with a full-time population. Accessible by free ferry from Ingalls Head or by boat. James Audubon visited the island in 1833 to paint birds. Primary school and store. Beautiful sand beaches, salt marsh and Long Point lighthouse. Can be accessed by foot at low tide from Cheney Island-Ross Island route but remember to check the tides. Across from Seal Cove. Still has a few houses and a church but consolidation during the 1950s saw people leave the island where few services could be provided for them. Many floated their houses to Grand Manan. Ghosts are said to abound on the island. The church is still used, usually one service a year and even the occasional wedding. Only a few of the remaining houses are maintained, the rest are derelict but lilacs, rhubarb and other garden plants still persevere. The only access to the island is by boat.